The philosophies of osteopathic medicine and family medicine are inherently harmonious. Both seek to treat the whole person (body, mind, and spirit) while respecting the self-healing capacity of each individual. Osteopathic theory and practice is based on the core concept that alterations in physical structure affect physiologic functioning, and vice-versa. By addressing these physical alterations (ie somatic dysfunctions) Osteopathic Manipulative Treatment (OMT) aims to correct aberrant physiology. OMT is indicated in many common primary care clinical scenarios. In Madison, we are pioneering MD resident education in OMT. 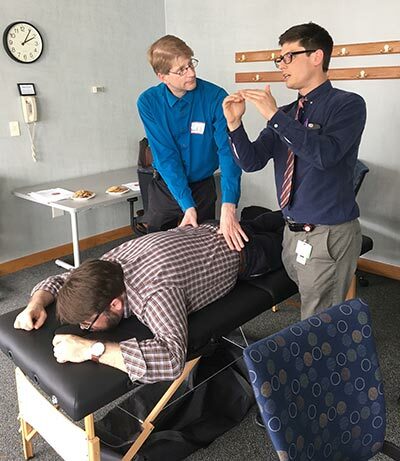 Our rich elective curriculum, which involves hands-on labs, clinical preceptorship, readings, and online modules, prepares the motivated MD to integrate OMT into clinical practice, to the benefit of their patients and their community. Jared Dubey, DO instructing Lee Dresang, MD in osteopathic assessment of the pelvis.